KOTA KINABALU: Just as expected, the Crocs ended the 2013 Premier League as the unbeaten champions after defeating Sabah 2-1 in the season’s ending match played at Likas Stadium yesterday. Keeping the unbeaten record was high on the Crocs’ agenda when they took on their neighbours and the narrow win was good enough for the newly crowned league champions to return home with yet another full point. Despite playing in front of the home supporters, Sarawak were able to hold the Rhinos’ attacks before a solo effort by Muammer Salibasic in the 28th minute put the team in the lead. He weaved pass three defenders to put draw first blood after Sabah custodian Shahril Sha’ari failed to clear his shot. After the wakeup call, the homesters had doubled their efforts and resulted in the equaliser in the 36th minute through Julamri Mohamad. The Crocs however found their winning goal through their top scorer of the season, Bobby Gonzales after connecting from Salibasic through the left flank before sending an easy shot to the left net. The score line remained the same in the second half despite Sarawak chance to add woes to the homesters’ misery and they nearly got it through a penalty in 48th minute. Bobby Gonzales who took the penalty however failed to convert the chance and the score line maintains until the final breather. Coach Robert Alberts when met after the game said the unbeaten run was an amazing feat by the Crocs. “The game was low on pace and I strongly felt that the boys can do better. 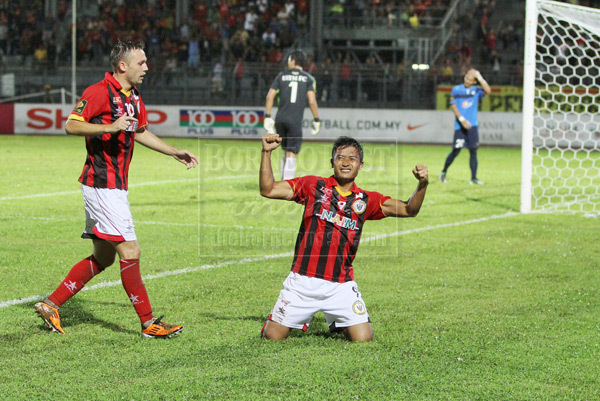 However it was an incredible season for Sarawak and we will let them have a good rest before making preparations for the Malaysia Cup,” said Alberts.